Please select a region from where you are shopping (EU or Non EU). This will help us calculate taxes properly. NOTE: if region that you selected is different from your shipping address, your order will not be valid! You can change your region by using pin icon on the top right menu. A fuzz pedal with long sustain and a lot of tone variations. 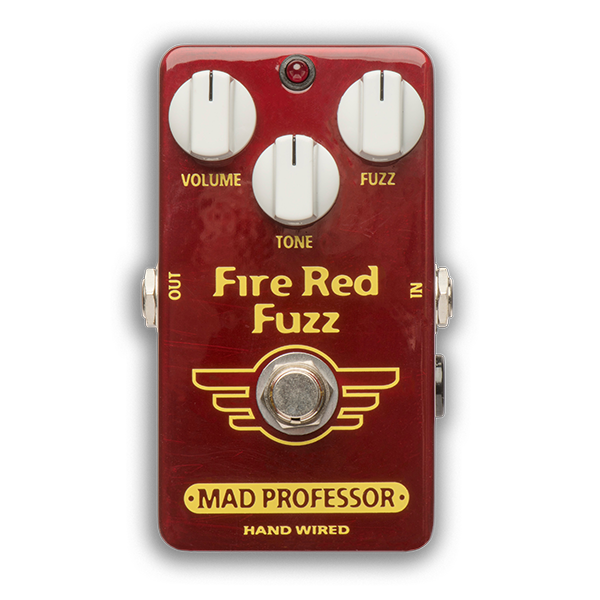 Mad Professor Fire Red Fuzz (FRF) is a fuzz pedal that is easy to play with long sustain and lot of tone variations. The pedal has a compressed, deep effect to allow equal sustain throughout the fretboard. Tone control was specifically designed to allow tones from the mellow fuzz, through slight mid cut to thin bright fuzz. The FRF is not another variation of a classic fuzz design but a unique pedal with its own character and extremely versatile Tone control. It is great for recording different layers of Fuzz tones from haunting dark to cutting thin bright. Whatever setting you use the tone is always very musical and controllable. Like all Hand Wired MP pedals, FRF is hand made in Finland using only premium components, to give years of trouble free operation with superb musical tone.